Mini sewing machines are ideal tools for teaching kids, taking to class, or keeping at a vacation home. They might be little, but a good mini sewing machine should cover all the basics well so that you can do mends and smaller projects without taking up lots of space. Sadly, a lot of mini sewing machines are gimmicky little appliances with short lifespans and rickety builds. In our dedicated guide, we’ll help you find the gems, and avoid the crappy toy models. Our recommendations are simple, reliable, and highly portable! 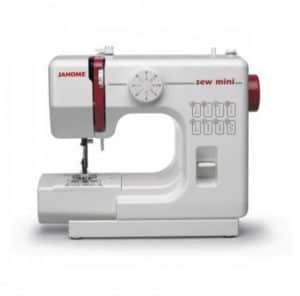 This updated version of Janome’s Sew Mini is the least expensive model we recommend in the mini category. It’s a 3/4 size machine that gives you all the key features of the larger Janome’s, only on a smaller scale. It has a few common stitches onboard, with a simple and user-friendly design. We suggest it to buyers on a budget, as well as those looking for an inexpensive, secondary travel model. It’s super affordable. The Sew Mini is priced well under $100, so it’s a very budget-friendly option for newcomers and for kids. That’s enough to cover most basic repairs and refits, and to quilt on a small scale. You can choose between them using a simple dial, following the diagrams printed on the face of the machine. The 4-piece feed dog is smoother than other models under $100. It’s not fair to compare to a 7-piece feature on a full-size, midrange machine, but it doesn’t feel as clumsy as many other miniature models. It has a simple push-pull bobbin winder. It’s easy to use, if no-frills. The presser foot lifts extra high to give you clearance. You won’t be doing many thick, layered projects on something this small, but it’s nice to have some extra finger space when you’re working on a small scale. It’s the least expensive Janome to have a convenient top-loading bobbin! There are 3 stitch width adjustments, and 5 for length. Since the Sew Mini has manual tension adjustment, it’s much easier to tweak and fix than comparable machines from Brother or Singer. Those brands typically use factory-set tension, so if it isn’t working properly, there’s nothing you can do without making a service call. The Janome is easy to troubleshoot and fix yourself. It’s all very simple and straightforward. This is a perfect machine to learn on, since nothing is complicated. It couldn’t be more portable. W 10.5″ x H 9″ x D 5.8″ The Sew Mini is only 5 pounds, and it fits underarm easily. You’ll have no problem bringing this to a class or group meeting. It’s also a great choice for younger kids who would struggle on a full-size machine. It comes in lots of fun colors, as well as a plain while model. It has poorer reliability than the Hello Kitty or the Jem. Janome have also let themselves down in the quality control department with this one. You should be sure to inspect and test your Sew Mini before your return window closes, because a percentage of units seem to be lemons. On the other hand, a lot of people report that they’ve used one of these for years. Here’s our take: this is definitely more reliable than anything else under $100. However, if you can spend more for the Hello Kitty or the Jem, they’re safer investments. There’s a good chance that the Sew Mini will last for years of light use. If you want to be absolutely sure, go for one of the more expensive options with more metal parts. There are only 4 stitches onboard, compared to 12 on our other picks. This one is quite limited, so don’t plan on doing more than a few basics on it. This is a good starter machine, but if you’re an intermediate or advanced needleworker, it’s better as a secondary model for travel. It’s not great for more than a few light layers. This is better than anything else under $100, but it’s by no means a heavy-duty model. It’s for light work, and light work only. Don’t expect this to be a workhorse in a small package! If that’s what you’re looking for, get the Jem. When we say no-frills, we really mean it. There’s no reverse button, drop feed feature, or free arm. There’s also no work light, no on/off switch, no measuring guides and no thread-cutter. This is a very basic machine. However, we’d rather go for something with fewer features that actually work than something complicated and unreliable. 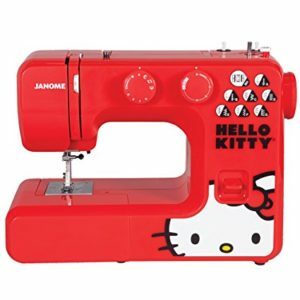 The Janome Hello Kitty is technically a full-size sewing machine. It’s so compact and capable that we couldn’t leave it out of our miniature guide, though! The Hello Kitty is only slightly bigger than our other two recommendations, and while it looks like a toy, it’s anything but. The Hello Kitty is a basic, all-manual sewing machine like the Sew Mini. It’s a lot more durable, though. This one has a metal frame, more metal internal components, and a great reliability record! If you don’t absolutely need a 3/4 format, and can make do with a compact full-size machine, this is a much more affordable alternative to the Jem! It’s a lot more rugged than the Sew Mini. The Hello Kitty might look like more of a toy than the Sew Mini, but it actually has more metal parts throughout the design. It has an internal aluminum frame, too! That makes a big difference in the rigidity of the whole machine. It feels much sturdier, and has less of a chance of the internals coming out of alignment. It’s more powerful, too. This one sews up to 800 stitches per minute, while the Sew Mini won’t even get to 700. While most people won’t buy something this simple as a workhorse, the Hello Kitty does perform like one! It’s neat and consistent with nearly all materials. We wouldn’t try super thick layered pieces on this one, but you’d be surprised at how easily it sews through denim! Most users won’t be limited at all by the Hello Kitty. It feeds smoothly, and sews cleanly. It also has more stitches built in. There are 12 on the Hello Kitty, and they’re all displayed on the face of the unit. As with the Sew Mini, you can select different options via a dial. It has both left and center needle positions. By contrast, the Sew Mini can’t be shifted from center. It has a reversing lever to go back and lock a stitch. That’s a feature you don’t get on the Sew Mini. There’s also a free arm! That allows you to work on cylindrical pieces far more easily than you could on the Sew Mini. It’s one of several features which make this one more versatile. You get measurements on the needle plate, as well as a work light overhead. Those are two big usability upgrades over the Sew Mini. Like the Sew Mini, the Hello Kitty has manual tension control. It stays pretty consistent by itself, and you can easily tweak it to perfect the settings. It’s nearly as portable, without cutting down your workspace so drastically. At less than 14 pounds, the Hello Kitty is easy to haul around, if not as lightweight or compact as the Sew Mini. It also has a fold-out handle built into the top to help you out! It’s only slightly more expensive than the Sew Mini, and less than half the price of the Jem! We suggest the Hello Kitty as a midrange pick for people who want solid build quality without spending a premium. It has a superb reliability record. The Sew Mini is quite good overall within its limits, but the Hello Kitty can take much more of a beating. It’s not a heavy-duty machine, but you can comfortably use it on a daily basis without worrying that it’ll wear out or break. Quality control is better on this model, too. It has a tougher bobbin compartment than the Sew Mini. The Hello Kitty’s is a traditional-style side-loading format. It’s perfectly good, but not as effortless as a more modern top-loading compartment. It’s all-manual, and while it has a few more amenities than the Sew Mini, you’ll still have to do your threading and winding manually. This isn’t technically a mini sewing machine. It’s full-size, but we think it’s compact enough to earn a place in this guide. The downside is that it may simply be too large for young children. If you know you want a 3/4 size model, rather than something that’s simply compact, look at our other picks. While it’s much sturdier than the Sew Mini, it’s not as rock solid as the Jem. This one still has a lot of plastic components, despite the superior reliability record. The Hello Kitty packaging is definitely aimed at kids. This is a perfectly suitable machine for adults under the hood, but some grown-ups may want something more understated. The Janome Jem Gold 660 is our absolute favorite mini sewing machine. It’s simply a pleasure to use, and is by far the most capable model we’ve found in a 3/4 size package. The Jem is reliable, well-equipped, and highly portable. We recommend this one to experienced and advanced sewists who want a secondary machine for travel or group sewing. It’s also a good choice for newcomers who know they’ll be sticking with sewing and want a compact machine. It has the best bobbin setup of the three! The Jem has a drop-in, jam-proof bobbin compartment. There’s a clear window on the top, so you can see how much thread you have left while you work. It’s by far the most user-friendly setup we’ve seen on a 3/4 machine. It has a built-in needle threader, so it’s the easiest of the three to get up and running. It’s a convenience that you don’t get on either of our cheaper recommendations. There’s also a thread-cutter built in, and it’s the only one of the three to have that feature. The 12 stitches on board include 2 stretch options and a buttonhole feature. You select your stitch via a dial, just like on the other models we’ve included here. All the stitches are charted along the arm of the machine. It has a 4-piece feed dog, just like our other recommendations. The Jem does extremely well on all materials, and we’re impressed by how rarely it doesn’t perform perfectly. It has extra-high presser foot lift, and an auto-declutch bobbin winder. There’s a free arm for cylindrical sewing–something that’s rare in a 3/4 format! You can adjust the stitch width up to 5mm, which is as much as most full-size models will do! Length is adjustable up to 4mm. Like the Hello Kitty, the Jem has a reverse switch, so it’s easy to double back and lock off your stitches. It’s built extremely well. This is our top quality pick for a reason! While it might have fewer onboard options than 3/4 options from competing brands, no mini Singer or Brother can touch the Jem in terms of quality! It has a metal frame, mostly metal components and a rugged feel. Between the build quality and design features like the feed dog and threader, it’s by far the most pleasant 3/4 machine to use that we’ve reviewed. You can do just about any light, small job on this one, and get great results. It’s perfectly suitable for quilting groups, sewing classes, or clothing repairs/craft projects at a vacation home. It’s nicely in between the Sew Mini and the Hello Kitty in terms of size and weight. The Jem is heavier than the Sew Mini, but it keeps the compact 3/4 format. At less than 12 pounds, it’s easy for anyone to carry to class or group sews. It actually has the same number of stitches as the Hello Kitty, even though it costs 2-3x the price. That’s not a complete surprise, given that the Jem is a smaller machine. It’s still disappointing, though. While the automatic needle-threader is a nice touch, it’s still pretty basic. That’s true of every 3/4 machine we’ve come across. There’s no drop feed feature. It’s heavier than the Sew Mini, at nearly 12 pounds. We think that’s still super manageable, and we’ll take the extra weight in exchange for rugged construction (this is heavier than most full-size Brother’s). It’s quite expensive. This costs more than twice the price of our other picks, so it’s not for anyone who’s not sure they’ll get a decent amount of use out of it. That’s one reason that we don’t suggest it for children, even though it’s a suitable size. You wouldn’t want to give this to a child unless you’re sure they’ll stick with sewing. The best of our choices isn’t good for thick, layered pieces. That’s true of any mini sewing machine. So, be sure you know what to expect from one of these! Which of our mini sewing machine recommendations is the best for you? 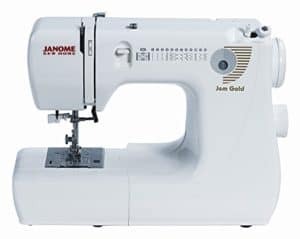 If you’re sure you want a 3/4 machine, and are on a relatively tight budget, the Janome Sew Mini is the model for you. It’s compact, lightweight, and portable. You can get it for well under $100, and it does a decent job on most light tasks. We think this is a good choice for anyone who wants an inexpensive secondary machine. It’s also ideal for a younger child’s first machine. The size makes it easy for them to manage, and it’s so inexpensive that it won’t be the end of the world if they don’t stick with sewing. However, the Sew Mini is built much more lightly than the Hello Kitty or Jem. It’s not something we recommend to advanced sewists. Plus, with only 4 stitches built in, it’s by far the most limited of our picks. If you want heavier build quality or more features, you’ll need to spend more for one of our other two picks. The Hello Kitty is more expensive, but we think it offers better value to most buyers. It has nearly as many features as the Jem, and sturdier build quality than the Sew Mini. This is our recommendation to the average buyer. It’s excellent for kids and adults alike. The downside of the Hello Kitty is its larger size. This is technically a full-size model, even if it’s smaller than other full-size options out there. And while it has most of the features you get on the Jem, it’s lacking in amenities. The bobbin system is trickier to use, and you’ll have to do all your threading manually. The Jem is our ultimate mini sewing machine pick. It doesn’t have the most features on the market for a 3/4 machine, but it’s the best-made we’ve come across to date. It’s rugged, reliable, and has enough features to be a dependable second sewing machine. If you only do light fixes and craft projects, it could also be your primary machine! Thanks to all its conveniences and smart design tweaks, the Jem is by far the most enjoyable of the three to use. The only real downside is the price. This one costs as much as a lot of full-size manual sewing machines. Unless it’s going to be your primary machine, it may be a hard purchase for most novice or intermediate sewists to justify. We recommend the Jem to advanced, passionate needleworkers who want a capable sewing machine to take on the road. It’s also the best choice if you’re looking for a mini sewing machine to be your primary workstation. If you have an ample budget, it could even be a spectacular model for a child! *If you’ve read through this entire guide, you’ll have noticed by this point that we’ve only recommended Janome’s. That’s because we’ve found that they’re the only company currently making mini sewing machines that are actually worth the money. Other brands like Brother and Singer have models on the market, but they’re flimsy and unreliable, to put it mildly. While no mini machine is going to be as rock solid or powerful as a full-size unit, we think these Janome models are far better than the competition. Mini sewing machines are a bit of a niche product. They’re super compact, which allows them to be portable and easy to pack up. That’s why we like them so much for traveling and taking group sewing events. Some people also choose a mini machine for a primary workstation at home. As you start to visualize exactly what you want to do with your mini sewing machine, it’s important to be realistic about what these machines are. They’re small, so they tend to be less powerful than full-size sewing machines. They’re also lighter, which inevitably means they’re less rugged than their big siblings. Mini sewing machines aren’t intended as primary workstations in most cases. If you’re a new needleworker, or buying for a child, a mini sewing machine can certainly serve as a primary workstation. That’s also true if you’re a very light, casual home user. However, for the vast majority of us, a mini sewing machine is a secondary workstation. With that in mind, you should consider that while a few of the best mini sewing machines are capable of stitching through denim and layered pieces, most aren’t actually intended for tough tasks. They’re for quilting in small pieces at a group meeting, or for working on crafts when you’re at a vacation house. These are not primary workhorses for canvas, layered denim, or leather. There are very few exceptions. Be sure to keep your expectations realistic as you shop. In our reviews, we’ve been sure to mention specific tasks you can expect our recommendations to perform. As you’re considering your budget, think about whether your new mini sewing machine will be your primary or secondary machine. Obviously, if it’s going to be your main workstation, you should consider spending more. You’ll also want to consider your skill level and the quality of work you want to achieve. If you’re a passionate quilter who goes to a group regularly, you’ll want to spend more for something compact that can give you the same quality of results as your larger sewing machine. Most mini sewing machines cost between $75 and $300. If you’re shopping for a child, you can easily find something good for less than $150. If you’re looking for something sturdy and capable which will last for years, plan to spend between $100 and $250. The more you spend on a mini sewing machine, the more features you’ll get. Things like automatic needle-threaders and free arms are available, but typically on the more expensive models. You’ll also find that you get better build quality as you go up in price. So, as you figure out how much to spend, ask yourself whether you need or want a more rugged model. As with any sewing machine, you should put some thought into which specific features you need on your new mini sewing machine. Consider the number of stitches you use on a regular basis. Think about whether having measurements on your needle plate is important. Do you need a free arm? Automatic threader? Hashing out all those specifics beforehand will help you narrow down your options. Finally, how portable do you need your new workstation to be? Do you want a true, 3/4 mini machine, or would it be more practical to go for a compact full-size? We consider both options mini. Hopefully, you’ve seen at least one mini sewing machine here that could fit the bill. If so, click on one of the links in its review to check current prices and find all the pertinent specs. Having second thoughts about whether a mini sewing machine is the best option for you? Head over to our homepage to see all our favorite all-purpose machines! Some of our picks are very portable. They can provide a more versatile alternative to a mini sewing machine without totally compromising on size and weight.